Arguably no American city over the past decade has experienced a greater urban core renaissance than Chicago. It is a city totally transformed. The skyline has been radically enhanced as dozens of skyscrapers were added to the greater downtown area. Millennium Park opened as a $475 million community showplace full of cutting edge contemporary architecture and art. There has been an explosion in upscale dining and shopping options, as well as large numbers of new art galleries, hotels, clubs and restaurants. But perhaps nothing shows the transformation of Chicago more than the huge condo boom, with thousands of new units coming online every year. This sent development waves rippling out from the Loop and North Lakefront, often into places that just a short time ago were no man’s lands. If you told someone 15 years ago you lived in the South Loop, they would have said, “Huh?” If you had told them you lived by the old Chicago Stadium, they would have thought you had lost your mind. These and other neighborhoods that were once derelict or dangerous, as well as some that were low key ethnic enclaves, have been transformed into bustling yuppie playgrounds for the new “creative class”. But there has been a downside to this for Chicago as well. The influx of the educated elite into the city has significantly raised housing prices in large parts of the city, rendering it unaffordable to others. Supporting the amenities demanded by the city’s new residents costs money, so taxes have gone up, doubling the squeeze on the city’s traditional residents, forcing many of them out. So in the end, despite its building boom, it is actually losing people. The Census Bureau estimates the city of Chicago’s population declined by about 60,000 people since 2000. That’s not much on a percentage basis, but, considering the urban core boom, it is telling. While Chicago’s metropolitan area continues to grow, it is doing so slower than the national average and has significant domestic out-migration. Chicago’s metropolitan area saw net domestic out-migration of 42,000 in 2008 and 57,000 in 2007. To put this in perspective, the poster child metro for urban decline, Detroit, Michigan, only lost 62,000 and 58,000 people in those years respectively. Only Chicago’s continued appeal as an immigrant magnet kept it from posting large overall migration losses as it had very high international in-migration. Chicago is an incredible urban success story, but only for some. International immigrants and the creative class are flocking, but everyone else is leaving. But there is another group of cities in the Midwest, much smaller cities, that are often overlooked, but which offer an alternative model. Places like Columbus, Indianapolis, and Kansas City provide a mirror image of Chicago. Their downtowns have resurged, if not from their glory days in the 1950s, then since their nadir in the 1970s. There is also significant condo construction in their cities. But, beyond these superficial similarities, they are nothing like Chicago. They lack the urban energy of that colossus, its huge inventory of swanky shops and high-end fine dining. They haven’t had a skyscraper boom. Most of their downtown development still requires significant tax subsidies. They feature largely vanilla brand images that don’t give them the coolness factor. And they continue to struggle in attracting top talent to live there. Yet in many ways these cities show signs of demographic and economic health that Chicago could only dream about. The Columbus, Indy, and KC regions are all growing faster than the national average in population and, unlike the vast bulk of the Midwest, have significant domestic in-migration. They are outperforming the nation in employment. In fact, it can be argued that they have as much in common with the Sun Belt as the Rust Belt. People are voting with their feet to move to these places. Between 2000 and 2005, about 7,000 net people moved from the Chicago metro area to Indianapolis, for example. One key to this lies in affordability. 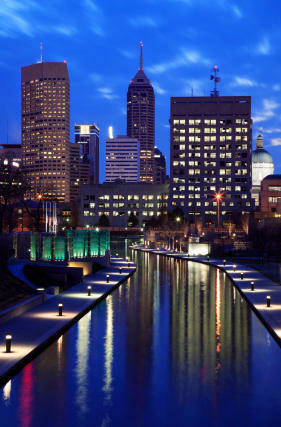 For years Indianapolis has been ranked as the least expensive major housing market in America. Blessed with few natural barriers and pro-private sector governments, housing supply in these cities has grown along with population. Yet at the same time the negative impacts of sprawl have been mitigated by their modest – compared say to Dallas, Phoenix or Houston – growth rates and relatively small size. This leaves them attractive, affordable, and offering a very high quality of life to people without elite professional incomes. In short, these cities are just as successful as Chicago; they just do it their own way and serve a different market. Indeed what we can see is that there are different forms of urban success. In an ever more diverse America, people define the good life differently. Too much urban policy is focused on one size fits all solutions that assume cities should look and function something like Chicago. But America’s cities are very diverse and require tailored policies to suit the local landscape, and the unique local geography, demography, history, culture, and values that our cities bring to the table. Great cities, like great wines, have to express their terroir. As with the consumer market, cities too need to recognize our increasingly complex and diverse population, and sharpen their strategic focus to the target segments they best serve. Chicago is tailoring its offerings to where it believes it can most effectively compete – new immigrants and world class talent. Places like Columbus, Indianapolis, and Kansas City are focusing on a broader middle class. Neither way is right or wrong. Both types of places, and others too, can all find success by offering unique places for people to realize their own personal American Dream. Submitted by cartercj1122 on Tue, 07/15/2014 - 06:29. Submitted by thscp1122 on Mon, 06/30/2014 - 08:17.